The sort of candy that I’m sharing today is eye candy. 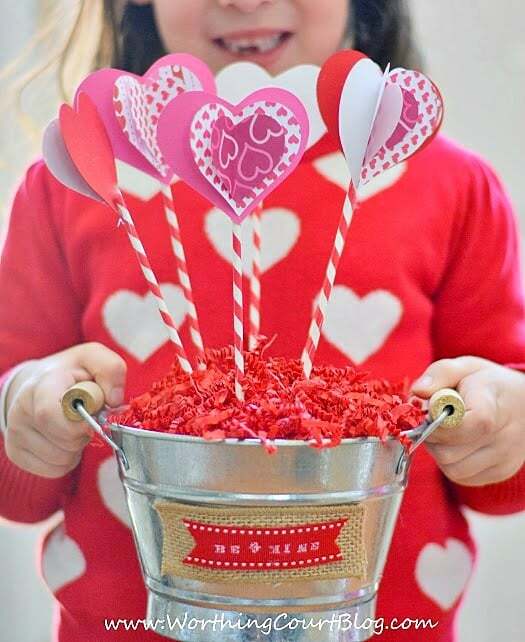 I’m going to show you how to make an easy Valentine’s Day Sweetheart Bouquet that is a perfect craft for marking this special day. Sometimes I find crafts to be very tedious. My crafts are notorious for not turning out the way that I imagine them. But this one was different – it wasn’t hard at all and I had fun putting all of the pieces together. 1) Cut the piece of floral foam to fit inside of your container and hot glue it to the bottom. Gluing it will prevent the arrangement from tipping over or falling out. 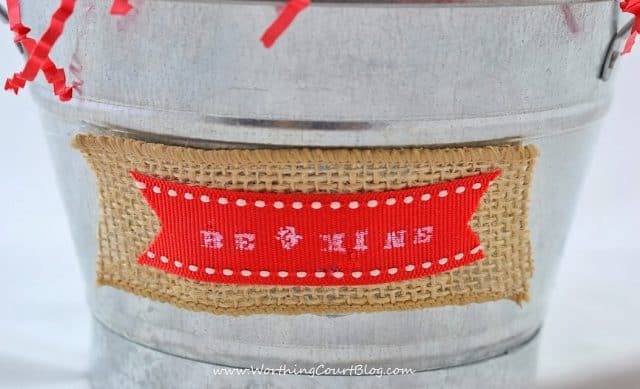 2) Embellish the container by hot gluing a scrap of burlap ribbon and then a smaller scrap of red ribbon to the front of it. Stamp a message of your choice on the red ribbon. 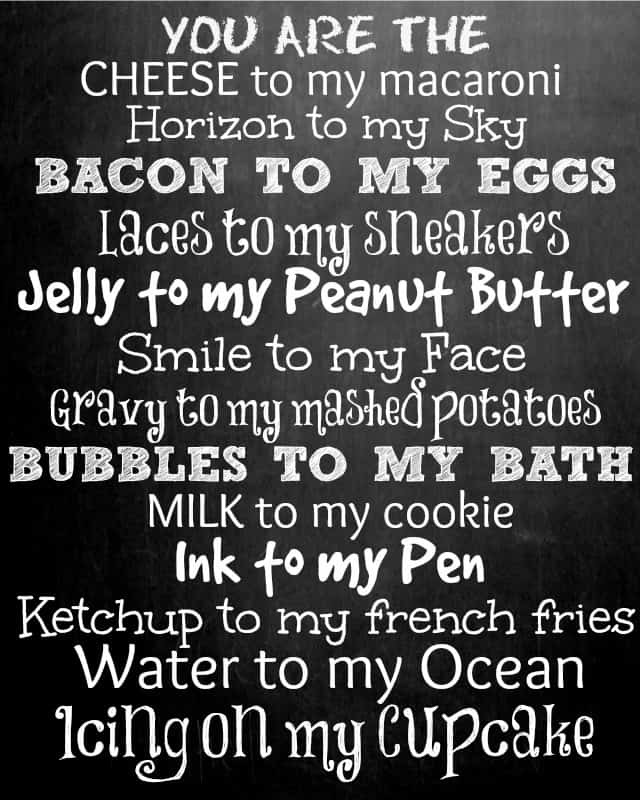 In my case, I stamped “BE MINE” in white ink. I know it isn’t perfect, but I like the imperfection of it. 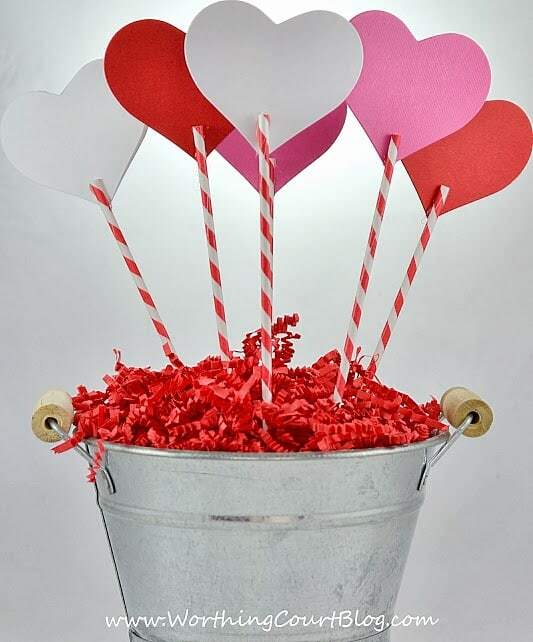 3) Determine how many heart “flowers” you want to have in your bouquet. 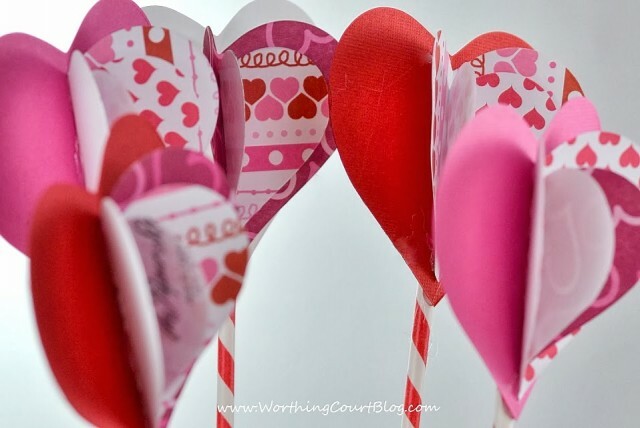 Cut 3 different size hearts for each bloom. The largest heart should be cut out of card stock as it will be the base of the bloom and the stiffness will provide stability. 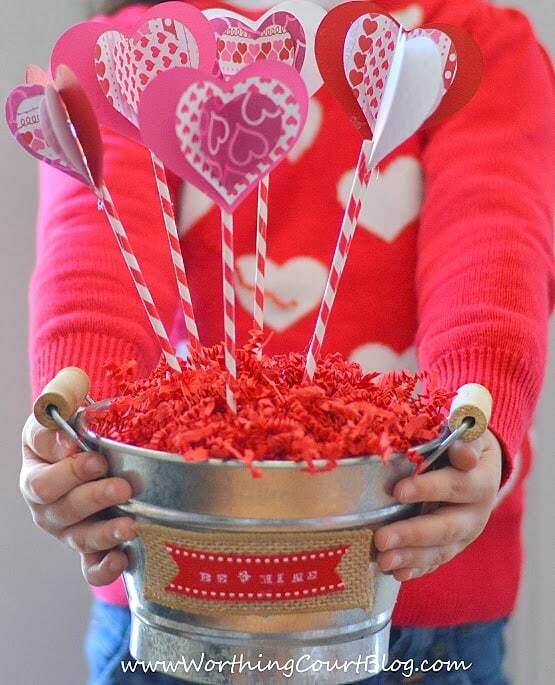 4) To make one bloom: Fold the medium size heart in half. Run a thin bead of hot glue along the crease of the medium size heart and apply it to the large heart. Reopen the heart slightly – don’t press it flat. Run a thin bead of hot glue along the crease of the smallest heart and apply it on top of the medium size heart. Reopen it slightly. You can see the 3D effect that folding the different layers gives to the flowers. 5) Run a thin bead of glue, about 1/2″ long at the top of one dowel, straw or cake pop stick that you’re going to use for a stem. Apply a heart to the stem. Here’s how it will look from the back. 6) Insert each stem down into the floral foam. 7) Cover the floral foam with preshredded tissue paper. My snaggle-toothed granddaughter, Miss K, was tickled pink to be my model. 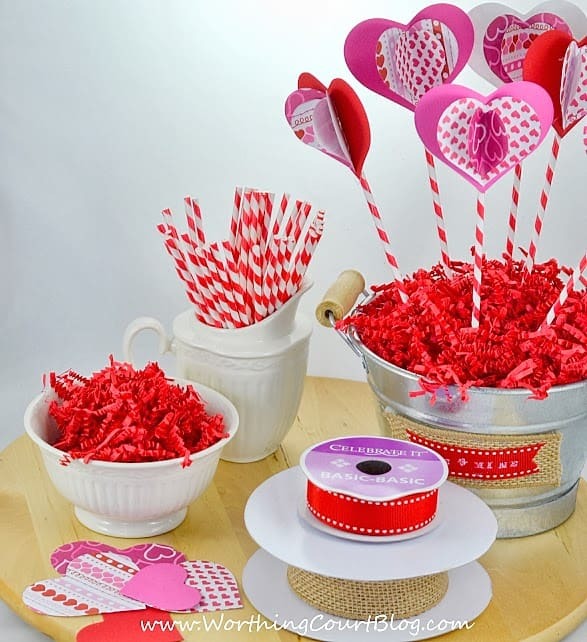 How about some free printables to go along with your adorable Sweetheart Bouquet? Adorable! And I like Miss M’s heart sweater too! 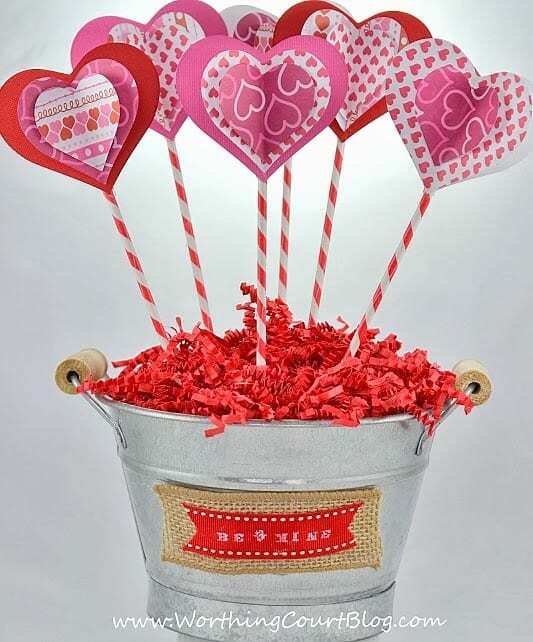 This would make the cutest Valentine gift for teachers! Especially with a gift card tucked inside! Thanks for the inspiration!